A terraced street. Rows of fronts joined together to make, in some cases, a unified facade of repeated elements – like this one. The street becomes a place which is (as well as pretty straight) enclosed by a continuous patterned wall of doors, windows, brick and roofs. This is the smart public face, seen here with some nice ornamental mouldings which link together across the units. Nice. The back is all different, because the back is a group of adjacent inhabited private spaces. Garden, fence, garden, fence. Even above the ground the architecture breaks out of the formality of the flat facade and steps forward, back, forward, back as the houses reach out into the space to get more rooms and more light into them. The walls go forward the roofs go with them. It makes a nice little pattern, up and down, as you can see here. Enjoy the sunshine people and look around. A terraced house is a house that is directly joined to another house on each side. Or rather you could say that it shares two of its walls with its neighbours. These walls are the party walls and they form the sides of the house – as if each house owns half the wall on each side. 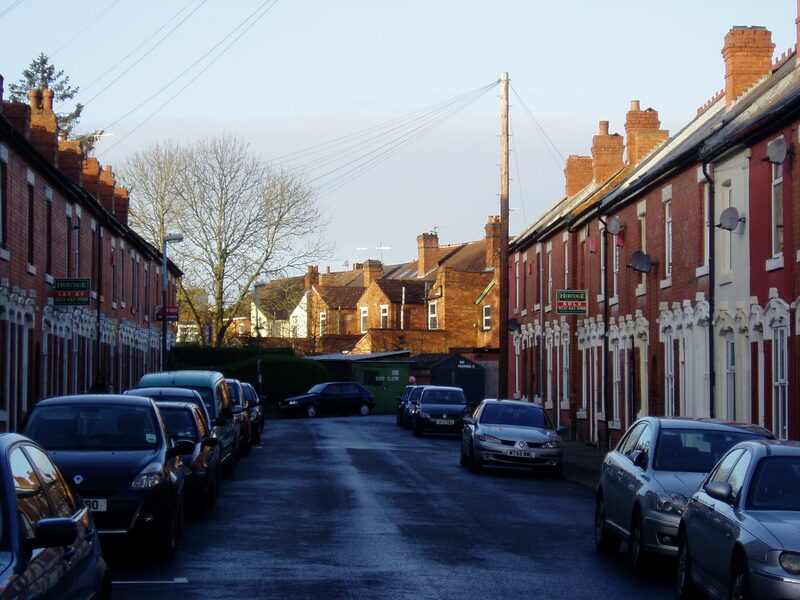 Terraced houses are built in groups – long or short rows of house fronts, with entrance doors and windows, with party walls in between, under a long strip of roof. The terrace is a typology, a pattern. Each dwelling is a part of that pattern and the terraces make streets, which make blocks which make a city of streets. Just as the house, and the terrace, has a front, facing the street, with or without a garden, each house has a back, with windows and a door and a garden. Sometimes (over in B12) the garden is just a tiny yard, but often you have a long narrow garden. Because the terrace front is a continuous wall, to get into the garden, there is usually a passage door every two houses Behind this door is a narrow alley cutting through the terrace block. The passage is a right of way for both parties and leads to a pair of private gates facing each other at a steep angle which lead into the private gardens. If the passage door is every fourth house, those without gates of their own have a right of way through their neighbour’s garden. The passage is nearly always 3′ wide and because of this width at the ground floor, the parties each get an extra 18″ in the floor above the passage as a result. Sometimes the chimneys are on the passage side, floating above the passage and stepping apart as they go down through the house and into the sitting room below. These passage doors are, to me at least, pretty interesting. Because they are owned by both sides, they deserve a special status as a communal door, but they only lead into the garden, so they are not as important – as a feature for architectural expression – as the entrance doors to the dwellings. So sometimes they are fancy like a front door, expressing security and status. At other times they are a garden gate, like the door to a shed. As they are shared between the two dwellings, the materials of which the dwellings are made meet at the top of the door. The passage door is a shared door and it’s centre line is a boundary. Half the arch is red, half the arch is white.